My own experiences with racist structures started early on in my life when I was forced to assimilate into an English-only classroom even though I was a native Spanish speaker. Though I was only five years old, it wasn’t difficult to comprehend that there was little value placed on the language my parents taught me. As I got older, I continued to have experiences that made me internalize a hatred for who I was. I hated having brown skin and wished my mom would let me bleach my hair blonde. The harm I experienced was so deep that by the time I was seven, I had internalized the bigotry I experienced via my fellow schoolmates, teachers and the racist policies of the school system. It wasn’t until I attended college and I joined a campus organization that I started working on undoing internalized oppressions and started to feel affirmed in my identity and the collective experiences of my community. Systems of oppression like White Supremacy are structured into laws and policies that are then reproduced by everyday people. The logic of these systems over time and practice gets embedded in our thinking and our actions and can result in people consciously and unconsciously inflicting harm and trauma in the community. Today, several community organizers in my life talk about the need to work at the intersection of culturally rooted healing and community organizing. This approach resonates with my own experiences and inspired me to create this piece, which illustrates how I see organizing. 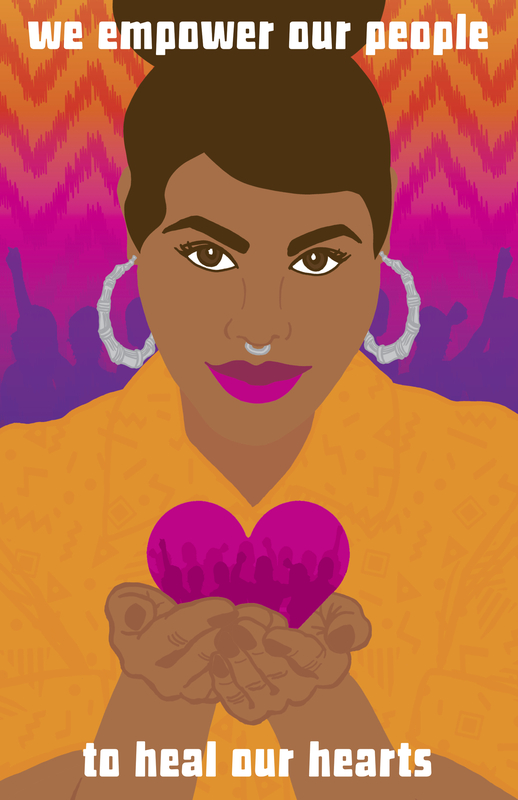 For me, organizing is a process for individual and collective healing through building power to achieve large changes in society that value each of us as sacred beings with interconnected lives.